The world of homemade fan costumes range from the breathtakingly cool, to the pathetically lazy. Which of these has the more pathetic costume? That's tough! 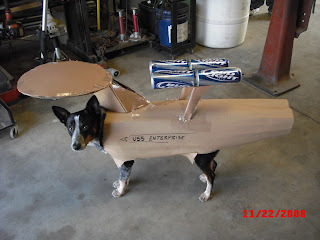 The dog's costume almost wins with the beer cans, however, the dog still looks cool - the guy looks like an idiot. Alex, you make a great point. The dog wears his costume with pride. 1 for Death Star Guy. I vote for the dog costume. 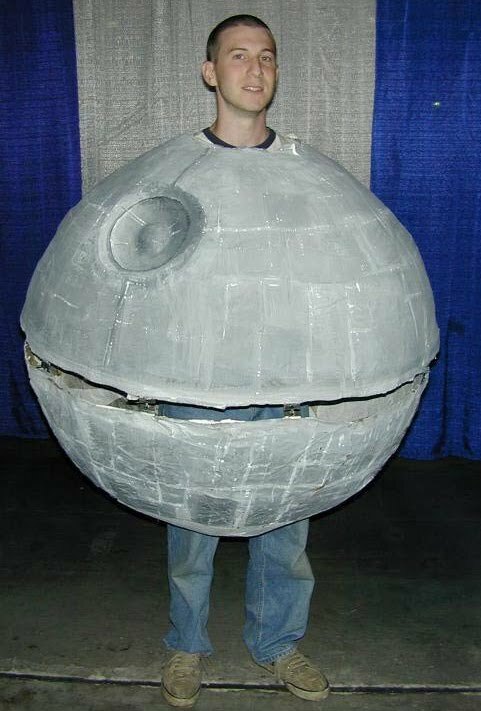 While the Death Star costume is stupid with the guy's head sticking out, the Enterprise costume gets extra lame points for the animal abuse. So far, it's a tie with 1 point each. Stephen Hawking Warns Against "Independence Day"
Pic of the Week: Time Traveler Captured on Film? Does Evolution Lead to Superpowers? The Controversy Over 3D in "Clash of the Titans"